Whisk together the balsamic vinegar, water, onion, red pepper flakes, garlic, salt, pepper, paprika, rosemary, parsley, chili powder, and oregano in a bowl, and pour into a resealable plastic bag. Add the chicken breasts, coat with the marinade, squeeze out excess air, and seal the bag. Marinate in the refrigerator 30 minutes to overnight. Preheat oven to 400 degrees F (200 degrees C). Line a baking sheet with aluminum foil, or lightly grease a broiler pan. Remove the chicken breasts from the marinade, and shake off excess. Discard the remaining marinade, and place the chicken breasts onto the baking sheet. Bake in the preheated oven until the chicken breasts are golden brown, and no longer pink in the center, about 40 minutes. 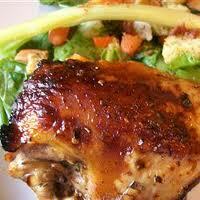 Enjoy the marinated chicken !